For me, Star Trek’s capacity to tell human stories has never been more powerful than when told by the characters who are artificial. While I could see the value in having heroes like Captain Janeway and Geordi, for me it was always the Doctor and Data with whom I felt a deeper connection. Growing up, I struggled with anxiety though I did not know it at the time. All I knew was that I felt a deep sense of not belonging, that everything I did, from the way I tied my shoes to the hobbies I preferred, was wrong. This feeling was not learned through years of middle school torment, though I certainly was not popular and I did struggle through the awkwardness of pre-teen angst. My wrongness felt innate. I felt it in my bones. I felt as perplexed and misunderstood about my own human experiences as the Doctor and Data, whose company I kept in the privacy of my own home, where I at least felt a little freer to be me. The Doctor and Data are programmed to be above human folly, and yet throughout both Voyager and TNG we see each of them strive and long cultivate hobbies, identify emotionally, and understand their peers on a deeper level. 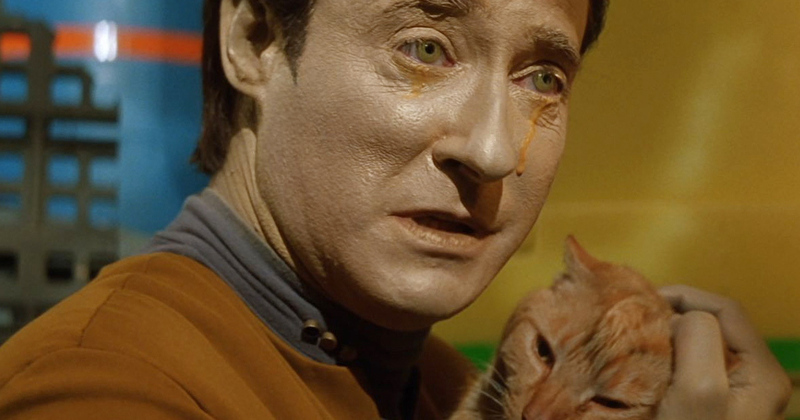 These moments are often portrayed with humor, as when Data writes his “Ode to Spot” in the episode “Schisms.” It is a poem written in perfect iambic septameter, undeniably easy for a walking, talking computer. What is confounding for Data is how to project the feeling of love that he has for his cat, something that anyone with a beloved pet can easily communicate. These moments are amusing, but they are also endearing. To be human is to be complex and often confusing, the journey equal parts painful and wonderful. We can relate to their awkwardness and humor because we have felt them. We have all been misunderstood and we know what it feels like to be the one in the room who feels different and separate from the rest. More than that, their motivations to identify with human emotions and follies is so that they can be a better crew member for those around them. Data and the Doctor are both respected and accepted by their crew members and I suspect they would be even if they remained chained to their programming. But that Data and the Doctor never stopped trying to feel as emotionally capable as their peers. Even when it was unpleasant, even when they get it so wrong, it always felt uplifting. It is why I initially wanted to relate this post back to current events and link Data’s and the Doctor’s stories to the necessity of hope. It now feels overwhelming given where we are. As a woman in my 30’s I now have a greater perspective beyond my own inner emotional turmoil. There are many reasons good to feel unpleasant lately, and to try and bring it all home by saying: “Be more like Data and the Doctor” feels insincere and overwhelmingly naïve. But I am going to softly argue it anyway. Star Trek as whole asks us to do better and to engage (literally). Data and the Doctor show use that human tendency can get us there. Both characters strive to understand humans and be more human so that they can be better friends, better listeners, and better coworkers. And their peers, who see them struggle and get it wrong, do not judge, but instead help. As the Doctor becomes a playwright they encourage the pursuit, just as Data’s peers take the time to help him understand why you can cry and be happy at the same time. And that desire and ability to help is the best quality we have as humans. To love a cat, is to write a poem, is to sing a song, is to fall in love, is to relate to someone’s pain, is to pick up a sign and march, is to stand up to someone else’s bully, it to shelter someone from harm, is to remember that the human experience – above all else – is to try and be better. Thank you for sharing this part of your life. I’m also a Trek fan and found my own voices like you did and some of mine do overlap with yours. My experiences growing up were different and my feelings of alone-ness, seperation, anxiety, stemmed from other things but we both learned the same lessons. I’m sure others were as helped and entertained as we were. Hopefully they’ll share here. Thank you! I think one of the best things about Star Trek is that their variety of characters and personalities offer something for everyone whether it is entertainment or personal comfort. There are a myriad of lessons to be learned through all the Star Trek series, though Voyager and TNG are where my heart especially lies. When shows allow us to laugh through pain, it’s even better. I love the parallels you’ve drawn here and the notion that what we take for granted, we should cherish. Thank you for sharing. i find it interesting that you said that data’s colleagues helped him understand all these things, because when i did a recent tng rewatch, i kept noticing data asking for more info or help and they just kind of.. go “ah that’s so human. well bye” and.. idk. i feel like he might’ve gotten there sooner if they were a bit more willing to sit down with him? some of his questions are quite difficult and vague, and a lot of those times his colleagues just give examples which data asks for more general answers, and they can’t, or don’t. i do feel like they were better at help with the doctor, admittedly, though largely only kes for the first few seasons. He did ask some vague questions about even the simplest things, I’ll grant you. I personally found his colleagues be sensitive and patient even if they couldn’t always provide him with a solid answer. Though I do imagine Data would be exhausting to be around at times which is certainly reflected throughout the series, as well, through those humorous “oh, it’s human” moments. Overall I find their attempts to be examples of good companionship even if they can’t give him everything he’s looking for. And I totally agree with you. The Doctor’s experience more developed in terms of the time they spent with him, and I think it helped that he could emote more than Data. being blk child of the 60s.star trek was a escape that I know all trekkies can relate 2.we as humans do so much harm 2 each other,data,the doctor an Spock made us want to understand if maybe taking emotions out and learning from the very beginning maybe a better way???????? ?